Do you know the feeling when you look in you kitchen drawer and see dozens of unused gadgets? Great news I found an other one for you unused gadget collection. Now for real, I think this gadget my excited you. 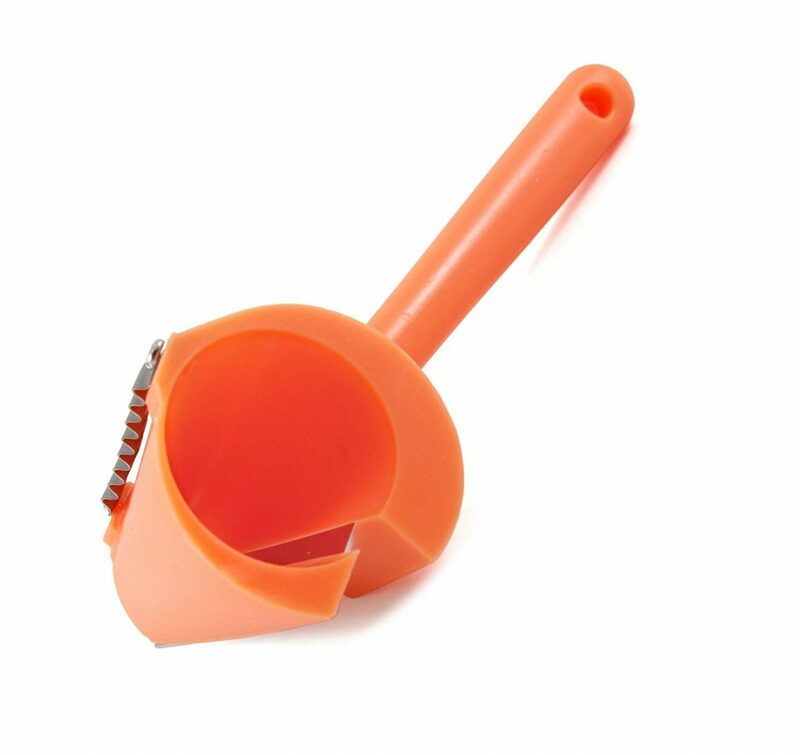 I hope that the easy carrot curler doesn’t gather dust. If you can sharp a pencil you can use this gadget. Hold the gadget firm in one hand and turn the carrot with the other hand. You can make short ones as displayed in de movie bellow or you can make large carrot shavings and use it as a sandwich condiment. The result – good or bad? To be honest I didn’t try it myself. But what I can see on the movie bellow, it works very easy with a nice result. So for me a dumps up. Yes, you also can make julienne peelings from fruits. 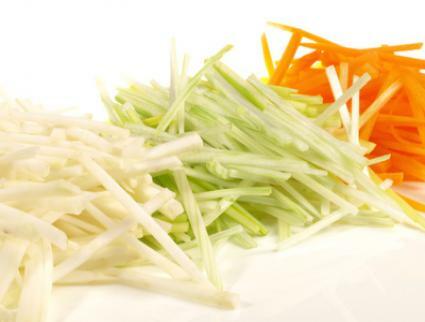 A few moths ago a have written an article “Top 5 julienne vegetables you won’t suspect”. Now it’s time for some unlikely fruits that are perfect for making julienne. There are a few things to keep in mind. For example they have to be quite hard. You also better take the less juicy ones. And if you want skin peelings you need fruits with a thick skin. You take a banana and hold it firmly in one hand, with the other hand …. No just joking, you can’t make julienne from a banana. But the following fruits are ideal for the job. All the fruits of the citrus family qualify. 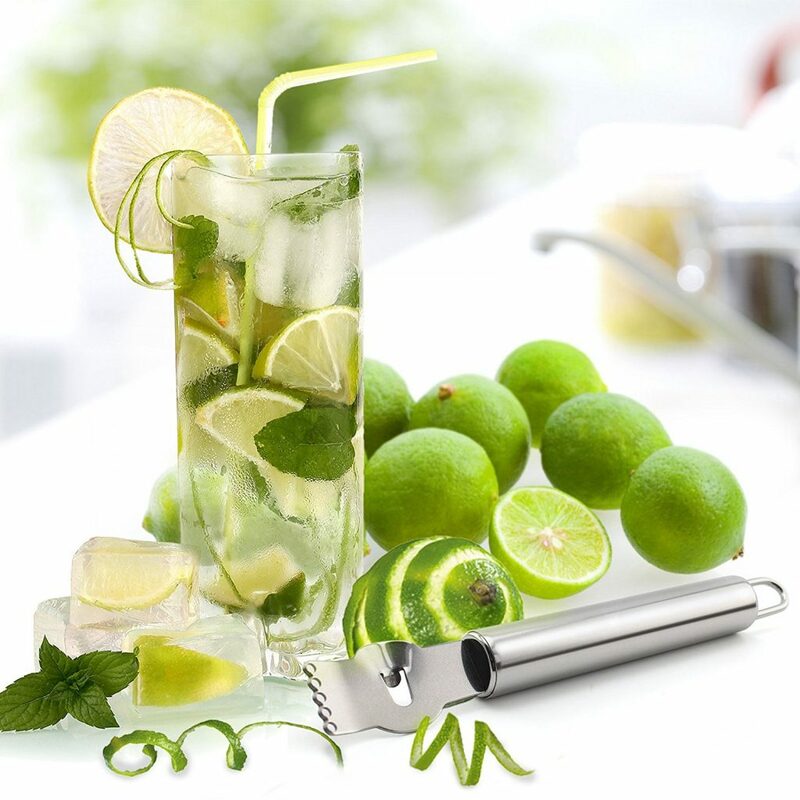 You can use Oranges, Citrons or Lemons. Of course we are talking about the skin and not the orange flesh. Why should you make peelings form a citrus? Orange zest is common used as flavoring. But the thicker julienne could be tart. But what do you think about using the skin for decoration on top of a dish or cocktails. 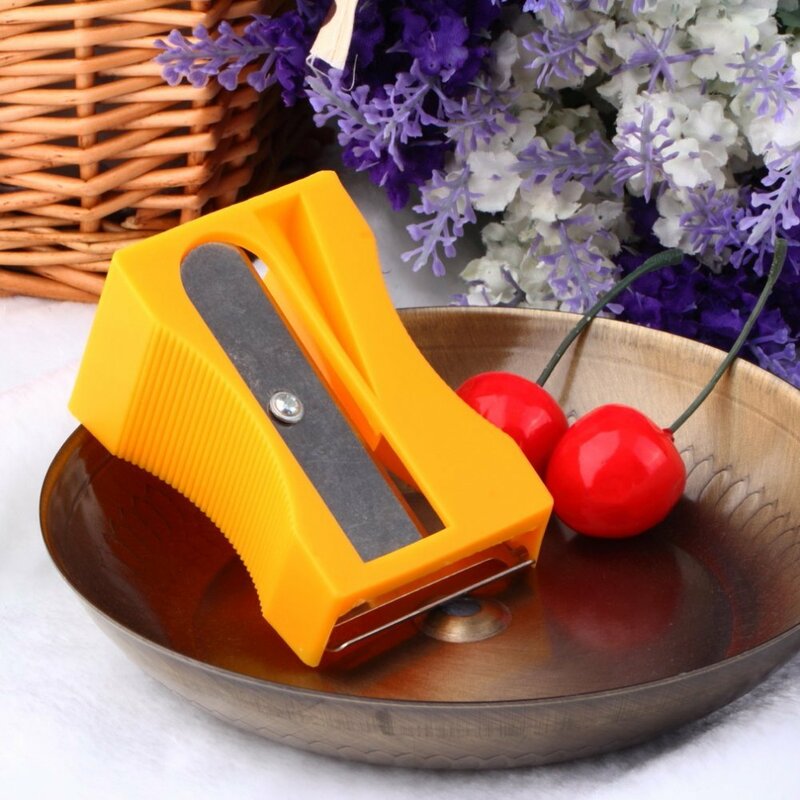 We suggest the 1Easylife Stainless Steel Lemon Zester Grater. Picture bellow. But my favorite way of using them is making candy. You can boil them in sugar water. Afterwards they have to dry and they ready to use. You can eat them like this or use the julienne candy stripes as decoration on tarts, cakes and other sweet dishes. When you are making julienne strips from apples always use firm apples. My first pick are the sour green variety. Because I love a little acidity in my salads. the green contrast make the other fruits pop. But they are also great in a vegetable salad. The easiest way to make julienne of apples is to slice them in two and start making julienne. If you like you can leave the skin. This gives a nice sharp green contrast with the rest. 3 Mango’s – where is the party? One of my favorite! Don’t go to soft, you need firm mango’s. You can use it almost every dish, especially in exotic dishes. The yellow color brights up every meal. My favorite? A cold salad with cucumber julienne, red onion strips, Whole wheat pasta, white beans and raw organic cashews. Just mix the ingredients up and drizzle some home made hummus over the top. You can add carrot julienne but I’m allergic so no carrots for me. 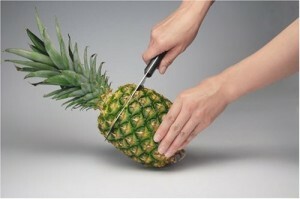 It’s always annoying to peel, core and clean a pineapple. This peeler/slicer tool promise a fast and clean version of this messy job. So let’s find out. It is made of 18/10 Stainless steel. So good quality strong steel. The handle is made of plastic. The most important thing is the connection between the steel and the handle. We hear often stories about handles that are broken of because of the force applied on the handle. This one is more than strong enough to handle this force. 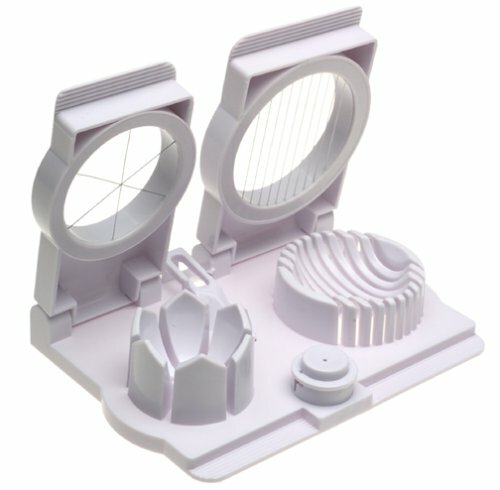 Is it worth buying the tool? YES, yes, yessss. 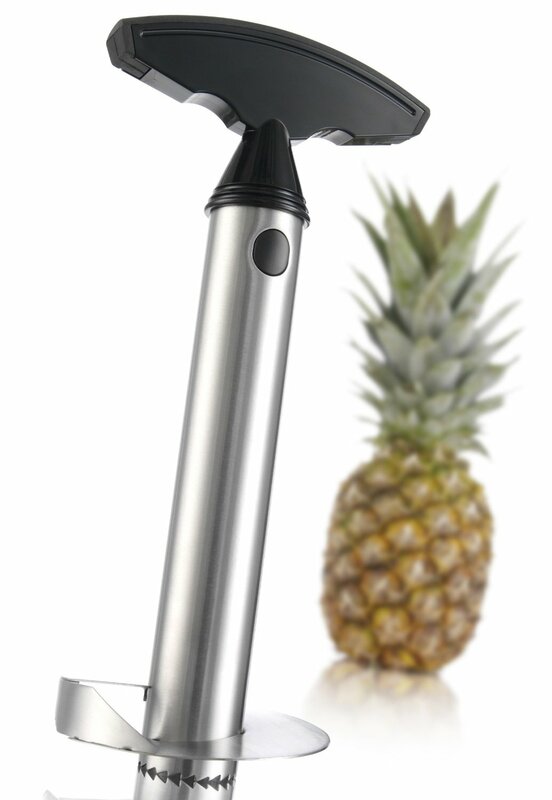 You will peel, core and clean you Pineapple ten times effortlessly faster with this tool . And it is much cleaner than working with a knife. Because it’s not an annoying any more, you will eat more Pineapple and we all know that Pineapple is delicious and healthy for you. Every year the same old question “What to gif to your loved one”. Does he or she loves to cook? Why not a kitchen gift? These are the top 10 kitchen gifts for 2016 for Valentine’s Day, enjoy! I made this list myself and is based upon the things I like and think are of real value, not another gadget that will be used ones and to store in your kitchen draw. 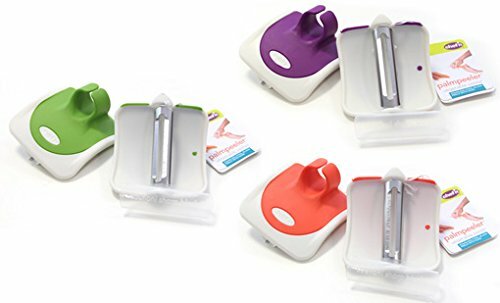 But a simple and functional kitchen utensil that speeds up your food prepping. All links that you find are affiliation links, this means if you click on the link and you decide to buy the item, a very small portion is given to me. I use this small income to pay for the hosting for this website. If you don’t want to do this. Just go direct to Amazon and search for item and click buy. So lets start to list my 10 favorite Valentine’s Day kitchen gifts. Kidding it’s not that amazing, but it does the job. This morning I had an hard boiled egg sandwich and normally (to save time) I just try to slice my egg with a sharp knife. Yes to save time, but it turns always into a messy fight between me a the egg. So I remembered that we had a Egg slicer. The advantages are obvious. Nice equal slices that don’t fall apart. The egg-joke stays nice in the middle and doesn’t crumble and it’s easy to clean. But above all super fast. Also the slices are super thin. The one that I h ave is the “Egg Slicer Wedger Piercer” three in one. First function is to pierce the egg before you boil it. This prevents your eggs to crack during cooking. After you removed the shell you can utilize the second or the third function. I said OR because in life you have to make choices. In this case wedges or slices. Slices are ideal for making tasty sandwiches and the wedges are more decorative to put in salads. To clean the egg slicer just hold it under streaming water. Golden tip: What about mushrooms? Yes It works also and also for small tomato’s. Everyone has to have a box grater in his or here kitchen. 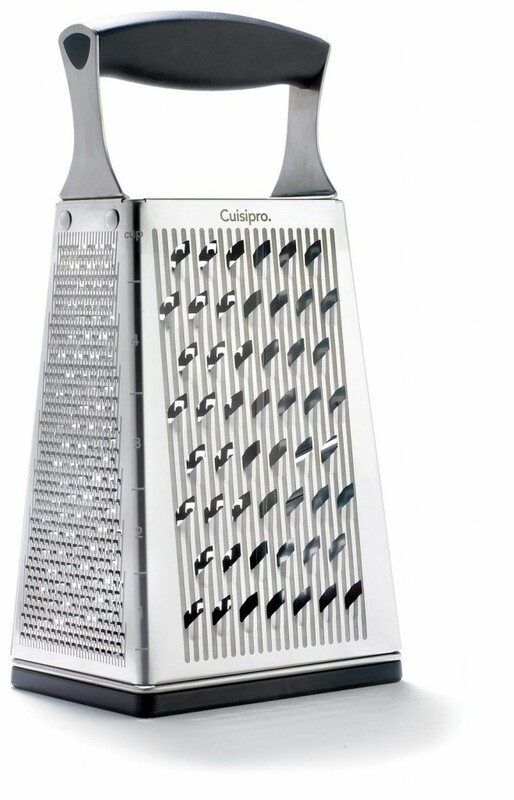 Also known as the clock grater because it has a cow bell (clock) resembles. I use my for one thing only and that is Parmesan cheese grating. Your own fresh grated cheese is a million times better than the pre-grated kind. You know what cheese you get and that there no fillers like cellulose (yes this is WOOD PULP). Besides cheese, vegetables are also great to grate. Carrots, pumpkins, cucumbers, parsnips, turnips, … the list goes on and on. There is one disadvantage and that’s the size. It takes up a fair amount of space. But the size is also an advantage when it comes to cleaning. You easily can reach inside to clean the box grater. But be careful not to harm yourself. Sounds to easy for this list but it isn’t. You can have hundreds of knifes in your kitchen but a small super sharp knife is the workhorse of the kitchen. They say the sharper the knife the less accidents you will encounter. And that’s all true a blunt knife causes injuries. The reason is the multi cuts that you have to make instead of one. More cuts is equal to more chances you cut you self. Ok we need a sharp knife that stays sharp. My first choice is a German made blade. Germans are known for there excellent craftsmanship. The knife is named Windmuehlenmesser (windmill blade). I’ts not cheap but it’s handcrafted and hand-finished. The company makes carbon steal knifes since 1872. Sometimes two worlds merge together. In this case a kitchen utensil and office equipment. The result is the Karoto . 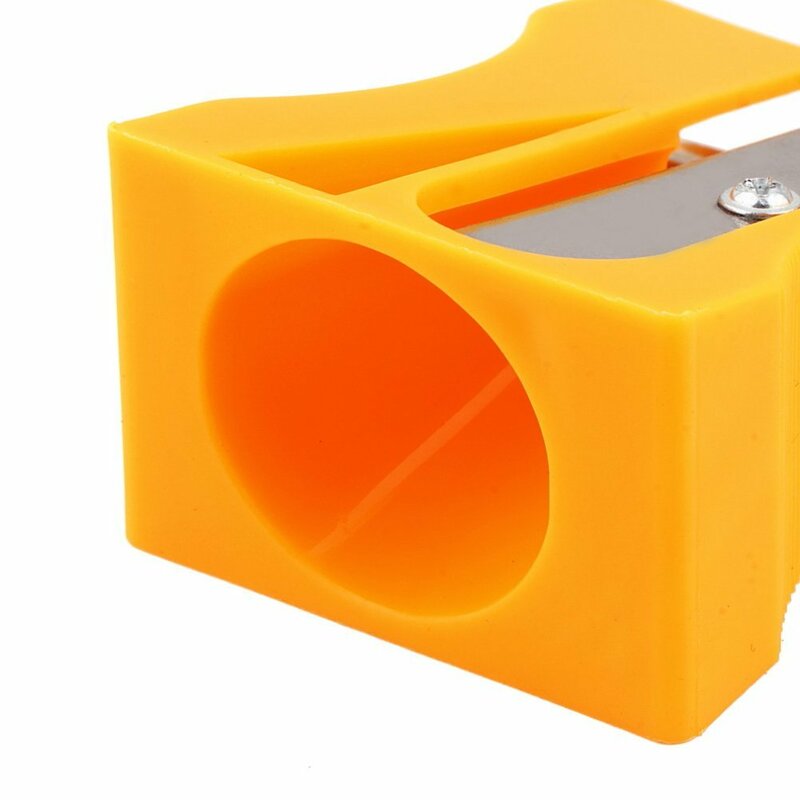 It’s shaped like a pencil sharpener but it’s a vegetable julienne peeler, or if you like a vegetable sharpener. Which veggie can be used? You are limited by the diameter of the vegetable. That said you can use carrots, courgettes, parsnips, cucumbers and long radishes. And other similar shaped vegetables. You end up with sharp pointy vegetables. But this for me the by-product. The curly ribbons are the real product of your laber. You can use them to decorate your salads, dishes and stir fry’s. 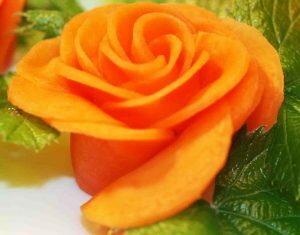 In my opinion it is useful for decoration but not for processing lots and lots of vegetables. I’ts a GADGET and it looks very funckyyy . On the picture color is orange but the actual color is black. But that doesn’t matter at all because it workes perfectly and it’s fun while using it. Almost using it every day, didn’t notice it has peeler on it until I got it. Arrived just as described and in a very timely manner. I would buy from this vendor againa and would recommend to others. 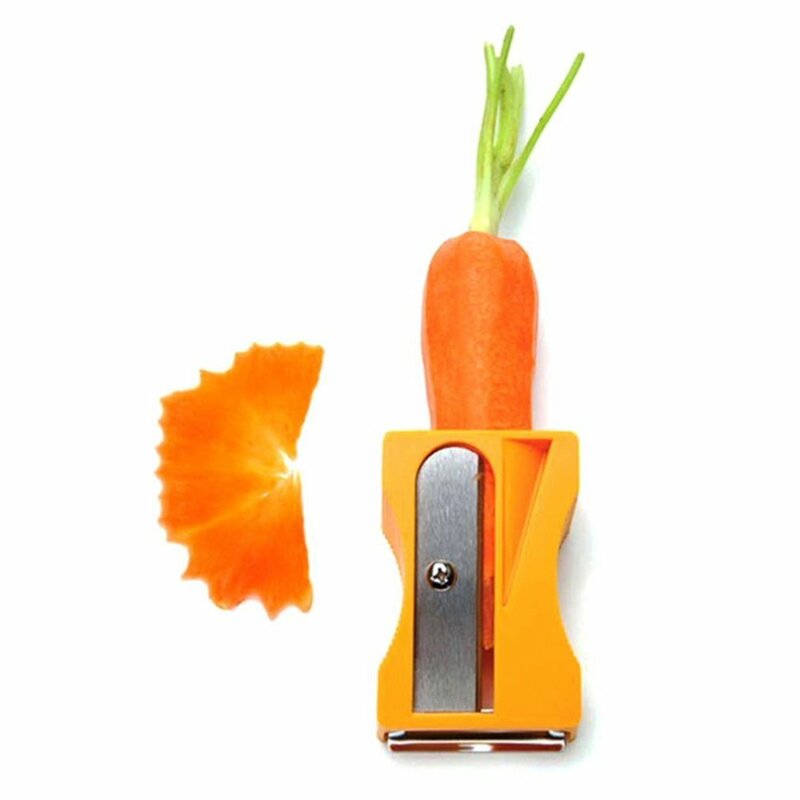 Nifty little tool – makes great curly thin slices of carrots, potatoes, cucumbers – and has a conventional peeler too. 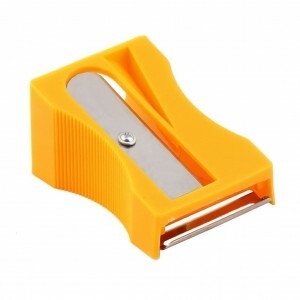 Good quality blades on both peelers – and solid plastic body that’s easy to grip. A great value for the price, whimsical and practical as well. Amazing and super awesome! 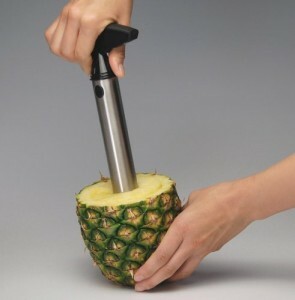 I’m getting this peeler for Xmas presents. 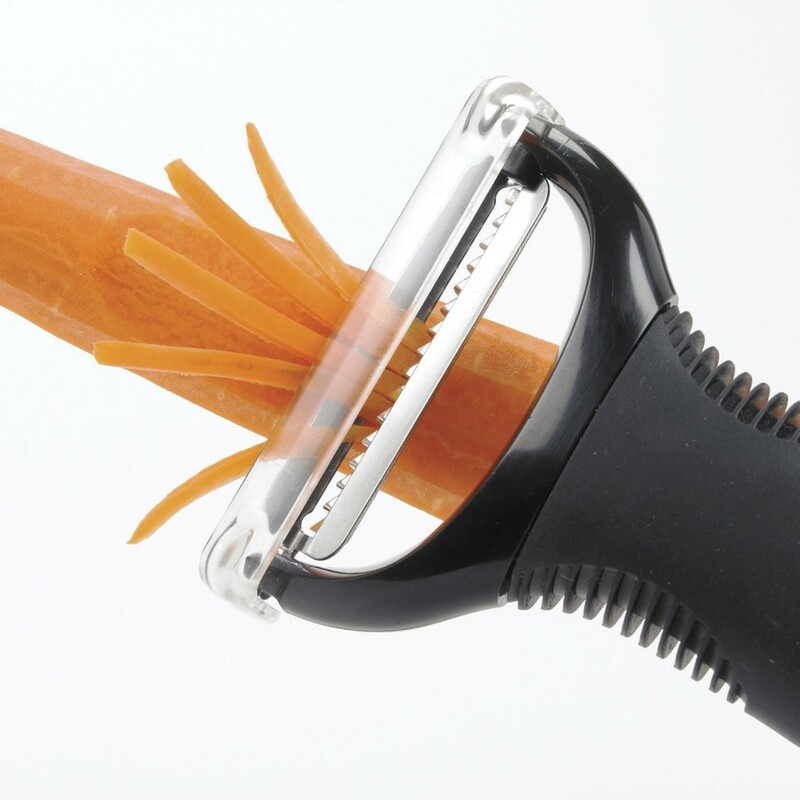 The best and most fun carrot peeler ever. I got one for myself a while ago and it works great. You can peel potatoes with the peeler at the tip of the sharpener. 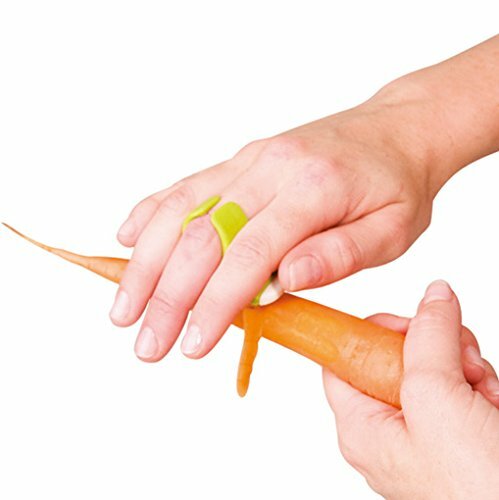 It fits my hand great and has changed the way I eat carrots. I’m going to get a few for xmas presents for my friends and family. This is a no brainer. I would recommend this to a friend. We are going to give a few out as Christmas presents this year as well. A great purchase that arrived quickly and well-packaged. My wife was really excited to get this for her mom for Christmas. I decided to get her one as well. She loves using it for salads. As the instructions tell you, she peels the carrot down the side first, then “sharpens” it. The carrot shavings look great on our salads and she is very happy about it! So husbands, if you want a fun gift for your wife (or yourself) I recommend buying it. What is better a julienne peeler or spiralizer? Julienne peeler versus The Spiralizer, which one is the best and wins the battle? The julienne peeler as the word already states is a peeler that makes julienne. The julienne are short and straight an less bendy. The Spiralizer makes long noodles and I call them Vegetable spaghetti. They both use sharp blades that cut into the greens. With the julienne peeler you can cut most everything that has a quite hard. For example carrots, parsnip, pumpkins, … And size doesn’t matter. But with the spiralizer size does matter. Because you have to put the vegetable inside the device. So you have to pick out cylinder-like greens that are not to big or you have to cut your own cylinders. And that takes up time, while the spiralizer suppose to be a time-saver. The outcome is very different as you can see for your self. If you won’t fine vegetables for in a salad ore soup or just as a side dish you better go with the julienne peeler. If you are making a healthy spaghetti or a nice stir fry you may prefer the good old spiralizer. They are both very easy to use. But when it comes to cleaning I rather choose the julienne peeler above the other one. I also find the peeler slightly easier to use. Because it’s a simple tool you can’t do much wrong. And I think in the long run the peeler will survive the spiralizer. I tend to the julienne peeler because of it’s so versatile. And I have simply more experience with the peeler. These are my two favorite julienne peelers on this moment. I was doing some research about peelers on Amazon and I came across this Palm Peeler. Probably the most safe vegetable peeler in the world. Easy does it, the peeler handles very easy. 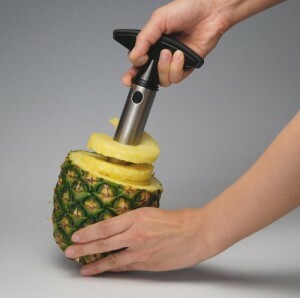 You slide your middle finger in the handle placed on top of the peeler. This way you never touch the blade. And your other hand is also save because of the border. The peeler blade is tucked in and you will never cut your fingers. The soft rubber grip enhances the grip and avoids slipping accidents. 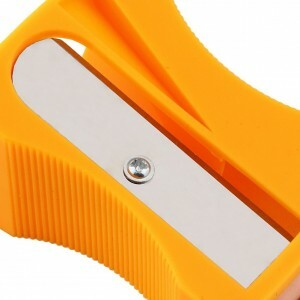 The Peeler is very intuitive, it is a neutral way of peeling, it’s like sanding wood with sandpaper, you have a firm grip on the peeler because it is inclosed in your handpalm. 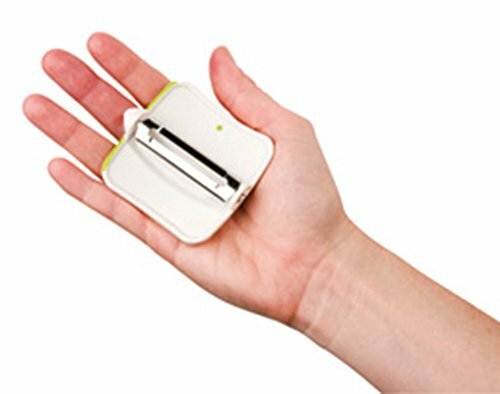 You can find the Palm Peeler on Amazon but there are no reviews yet. Therefore this short review. The peeler comes in three wonderful colors: Green – Red – Purple. This is by far the best peeler I have ever used. I used it once and went out and bought 4 more so I’d have an extra one and for gifts. Since then it has just gotten better! Once you get used to the way this peeler works, you will love it. 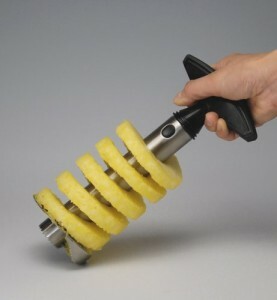 It works exactly as described, and takes a lot of the strain out of peeling fruits and vegetables. 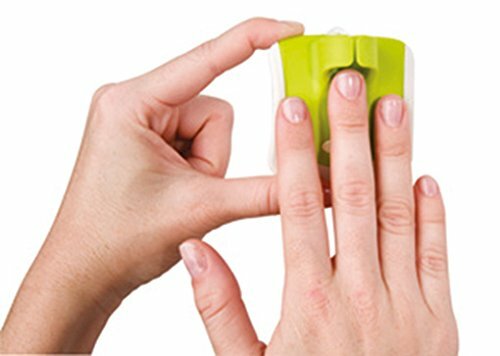 This may peel all right, but you can’t really hold a potato in one hand and NOT peel off your finger tips with this gadget! It’s still sitting in my drawer, but I still reach for the old fashion one that dents my hand with it’s sharp handle. Still looking for the perfect peeler. I don’t usually use a vegetable peeler and though I would try this one. I much prefer using a paring knife to peel my vegetables. It takes too long using peeler. I guess this one is as good as they get. The wife wanted one, because her mother had one she liked. The issue? Ours came incredibly dull. You can see that the blade wasn’t ground all the way to the apex, and as a result you can just barely use it to peel very hard veggies only. Want to peel something a little softer, like say an apple? Good luck. 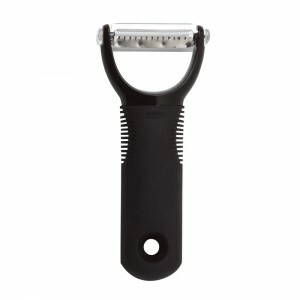 The peeler is indeed very save and easy and intuitive to use. Your loved ones remembered your anniversary, and a fruit hamper delivery just arrived at your house. A big basket filled with healthy deliciousness is a thoughtful present, and with your guests on the way you still have some time to find the best way to serve the fruit. Roll up your sleeves because this post is about to get creative! This is a great way to trick your young ones to eat something healthy. 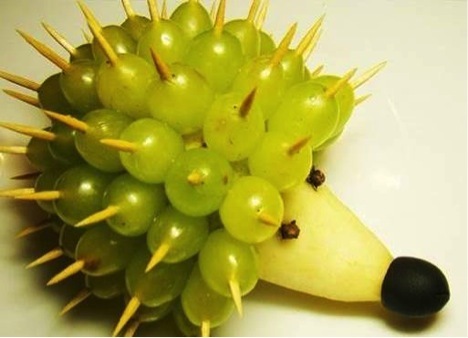 A fruity hedgehog takes less time and skill than the viral Healthy McDonalds meal. All you need for your little prickly bundle of sweet is a pear, some grapes, two cloves and toothpicks. Peel the pear with your peeler, in order to get the smoothest shave, and riddle its chunkier half with grapes on toothpicks, and add the clove eyes – watch the kids fall in love with the cute animal that is actually a good, healthy meal full with vitamins. This is just one example; keep your ideas fresh as your fruits. Slice and dice your fruits, and then skewer them on a wooden kebab stick. Play with colors and flavors – try to get an ombre look with berries of different shades. 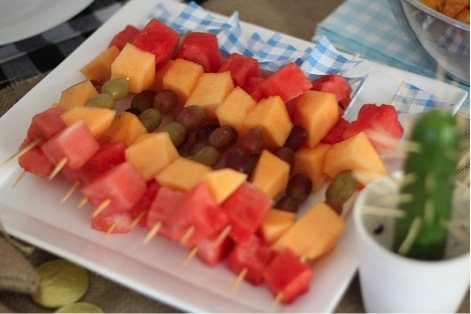 Fruit kebabs look classy on their own, but you can dip them in sangria for a real party trick. Plus, guests will enjoy their snack of sticky fruits AND keep their hands clean. 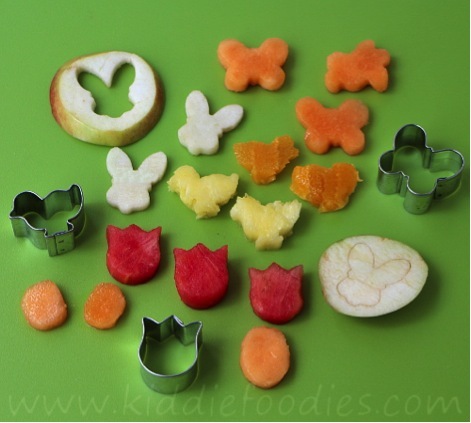 Simply use cookie cutters to create adorable snacks. Most fruit is firm enough to stay put under the cutter’s pressure, and soft enough for a clean shape. All you need to do is find your best cookie cutters and apply them to fruit that has been peeled and cut into thick slices. This one is classic for a reason. 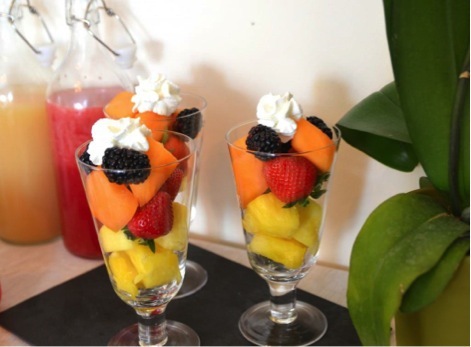 Everybody loves a colorful fruit salad, and if you serve it in a tall champagne glass, you can take it from comfortable to luxurious. All you need are champagne flute glasses, and a mixture of seasonal fruit, such as the ones this Sydney-based fruit delivery is best known for – all washed, peeled, and sliced. Use a julienne peeler to keep the fruit intact, not mushy, as you peel and slice it. A fruit salad is always a great choice for a dessert, and it works as a light and healthy snack that you can refrigerate for a while. If you have basic baking skills, this one will be a piece of pie – a pizza pie. You could use pre-made sugar cookie dough, but if you have the time, handmade cookie dough always tastes better. Cover the dough with a cream cheese topping, and cover it all up with fruit. It’s not really an alternative to real pizza, but it is a fantastic meal nonetheless. 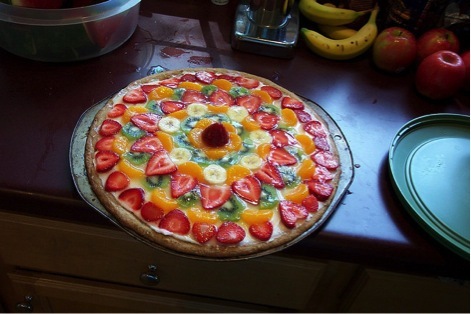 The same way regular pizza ham and cheese is best when shredded and blended into a smooth mix, try going through your fruit pizza toppings with a julienne peeler, and mix those up as well. If you are dealing with picky eaters (children, most often), you can still find clever ways to include these fresh sources of vitamins into their diet. 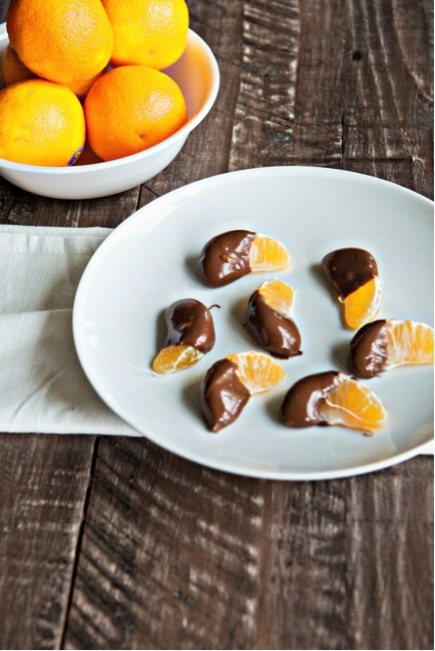 Disguise your fruits, cover them in chocolate and/or cream and see if they go untouched. Chocolate-covered strawberries are maybe not the best way to consume your fruits, but nobody will turn them down, that’s for sure. Where can I buy a julienne peeler? I had the same question. I didn’t want to buy online. So I searched store after store. It seems that a Julienne peeler is hard to come by if you are searching for it. But eventually I found one. It was the Rösle Julienne peeler. Rather expensive but a very good one. So I ask myself what are the different options for buying a Julienne Peeler and maybe this will also be interesting for other people. So here we go. Although I was reluctant to buy online, the benefits for buying online change my opinion. The biggest benefit is the easy way to compare different prices in different online stores. An other great benefit are the reviews of people who actually bought the peeler. 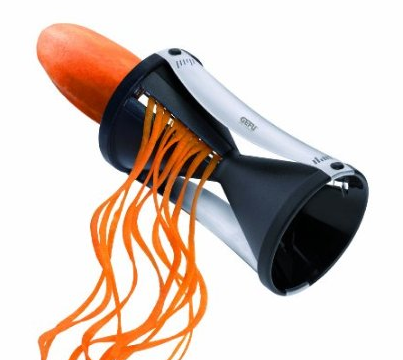 Some julienne peelers have over 300 reviews from people who use the kitchen utensil every day. These reviews are golden for a buyers like you and me. Based on these reviews you can decide if the peeler is a perfect match for you. An other benefit besides to the price comparison and the reviews are the extensive description. If you take the Precision Kitchenware peeler for example you can see that the description is very complete. And certainly more extensive than you would find on a packaging in a department store. The last benefit I want to mention is the possibility to research the product online. Read reviews, ask questions on forums or watch review videos on Youtube. The possibilities to research the product are endless. Now I think about it, this also good be a disadvantage. Making a decision could be difficult with all that information online. Use Familiar Websites, Start at a trusted site rather than shopping with a search engine. Search engines are good for research but when it comes to buying choose one you now. For example Amazon. Decide if you want to buy one or a set, sometimes it’s cheaper to buy a set. For example, a julienne peeler and a normal vegetable peeler and maybe a kitchen knife. But if you won’t a high standard julienne peeler I recommend to buy it separately. Quality and finishing, ask your self “how many times am I going the use the peeler” and am I going to julienne lots and lots of vegetable all in ones?” Maybe A julienne peeler is not a good fit and a mandolin is better or an kitchen robot with the right blades that can maken julienne cut vegetables. Look for promotions, Don’t buy the first one you find, do your research, compare prices, find out if there are extra’s (bundle sales) and last but not least watch out for sales and save money. have a kitchen department. Nine out of ten you can find a julienne peeler. The assortment differs between stores. Sometimes you can choose out of ten different peelers. But very often the choose is limited to one or two peelers. You have to drive to a store. Another review and this time it’s the oxo good grips turn. Handy, easy to use and also cheap peeler. This one is special because of the grip. It has an grenade grip in the middle that fits comfortably in the hand and prevents slipping. So it’s very safe especially in the kitchen where you have often wet hands. The second design feature is the flip-top safety cover what has to purposes. To prevent cutting your self on the blade. To guide the julienne peelings, this avoids the julienne to get stuck. OXO employees believe there are two rules that should guide product development: First, every new product must deliver a significant improvement over the status quo. Second, the functionality should never be sacrificed to make the product more attractive – above all it should work well. You can find a OXO’s iconic Swivel Peeler in museums all over the world, including New York City’s Museum of Modern Art. Next time, you can tell your friends that you have a museum piece! The handle is the best I have seen up to now. The grip is intensive tested and retested until they found the best possible grip there is. The blade is high quality and stays sharp also after years of peeling. My score is a well earned 9 out of 10.